is the bomb. Wonderful for mural work and store displays. 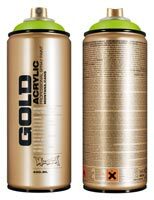 Canvas art supplies include Montana sprays because the spray cans work with a level cap system, allowing both low- and high-pressure performance in the same can. By just changing the cap, artists can go from low-pressure output for working in thin lines and fine detail, to high-pressure with a high output for easily filling in larger areas. It is suitable for indoor work, as the atomized spray is reduced to a minimum and is nearly odor-free. The paint is also 100% lead and CFC free. Starvin' Artist is an amazing custom picture framer that is also an art supply store in the Chicago area. The cans feature a colored ring at the top of the can that identifies the color inside and may also help the artist visualize the color mix of their artwork. The acrylic-based formula allows for ease of working in mixed media.